Fighting Gravity Fitness is proud to present monthly events that are sure to be fun, engaging, and fitness or wellbeing oriented. Each special event comes at a special event pricing and registration will be available in advance. Auto-Pay clients will receive a discounted offer. We love to have fun! So this Aerial Flips & Tricks workshop is definitely gonna be fun! We have separated the workshops into beginner-intermediate and intermediate-advanced levels. You will learn multiple poses, flips or tricks in either workshop. Come to one or come to both workshops! If you have never done a Flips & Tricks workshop before, it is best to take a beginner-intermediate workshop. The workshops consist of 90 minutes of instruction, with extra spotters and instructors and safety mats. We will give you plenty of time to practice and try each trick multiple times. Register early! These classes fill up fast! This workshop focuses on the challenging flips & tricks that are covered in the Advanced Aerial, Suspension Fitness, Aerial Fun & Flips, Aerial Dance, and Aerial Barre classes. We will guide you through this 90-minute workshop and teach the techniques in a safe, step by step and informative way. You will have plenty of time to work on and master a variety of flips and moves that are challenging yet fun. After completing this workshop, you are sure to be able to master the moves and become more confident and ready for anything in your next class! In this 90 minute workshop, we will go over some new tricks and advanced moves that we do not offer in our regular classes. We will guide you and teach the techniques in a safe, step by step and informative way. You will have plenty of time to work on and master a variety of moves and flips that are challenging yet fun and beautiful. 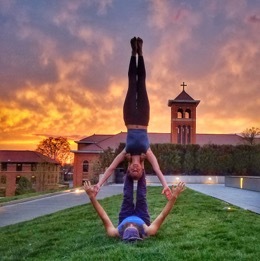 AcroYoga is a practice that blends yoga poses with dynamic acrobatic movement while cultivating trust, playfulness, and community. This workshop is designed for beginners ready to try something new! Each session will begin with warm-up games that will get you ready to move and break the ice. First we will explore fundamental AcroYoga poses. Later we will link these poses together through dynamic transitions to create a fun flow. Our goal with this workshop is to create a welcoming environment for students to try this fun practice and connect with others. No experience with yoga or acrobatics is necessary. A partner is not required. It’s is a fermented tea that has been consumed for thousands of years, but has become a new health trend that has gotten everybody hooked! Not only does it have the same health benefits as tea, but it’s also rich in beneficial probiotics. It contains antioxidants, that can kill harmful bacteria, help fight several diseases and improve gut health. 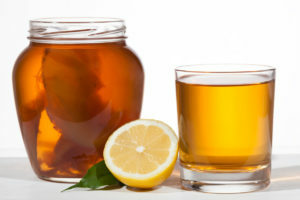 With its increasing popularity, Kombucha has become quite expensive in stores. In this workshop, you will learn how to make your own batch at home as well as how to flavor it to your own liking! Now you can enjoy this healthy, delicious power tea for a fraction of the price! All items and ingredients are provided in this workshop. BUTI Yoga®, meaning “the cure to something hidden or kept secret”, is a fusion of yoga, tribal dance, and Plyometrics, with some spiraling movements aimed at unlocking and releasing the Shakti spiral as well as the hips to help energy flow freely in the 1st and 2nd Chakras. BUTI® combines various styles of Hatha yoga with tribal-influenced dance sequences to keep the heart rate up, free the female spirit and help women form a tribe or sisterhood. Add some glow-in-the-dark body paint and black lights with some awesome tribal music and you have a BUTI GLOW PARTY!!! Kim Fuhrmeister will be leading us through this workshop with the first hour consisting of an introduction of what Buti Yoga is and teaching you the signature BUTI moves with proper form and technique. After the intro., we will break into helping each other applying glow-in-the-dark paints. Then the last 60 minutes will be a high energy, heart pumping, full of excitement sweat fest with lots of support from your fellow sisters. Sign up early to grab your spot! Invite your friends, have fun and let loose to a heart-pumping playlist while enjoying the club-like vibe! To get the best results, wear white or light colored clothing. Bring anything that glows in the dark, we will supply the paint and glow bracelets. Click here to see how much fun Buti Glow Yoga is! We are bringing a whole new meaning to the phrase “downward-facing dog. Doggie Yoga or “DOGA” is for the dog lovers to share a relaxing yoga class that is fun and very lighthearted. No seriousness in this class, although you will still get the benefit of the yoga class. Your dog needs to be social around other dogs and people. Cost: $25.00 and a portion of the proceeds go to help support F.E.T.C.H a cure for dogs suffering from cancer. Need some serious relaxation? Find stillness of the mind and enjoy the scents that allow you to go deeper into the relaxation you need and deserve. This is a perfect combination workshop. You will float in the hammocks, and breathe in and learn about what scents are used for relaxing, enhanced focus, and de-stressing. This workshop is brought to you by Audrey Bonafe a certified Aerial Yoga instructor and Lisa Cusano a specialist in Do-Terra essential oils. No experience with yoga or acrobatics is necessary. Our talented aerial instructors, Sydney Leighton and Gabriella Mikulas will offer a 2 hour Mixed Apparatus Workshop that will focus on you working on Silks and Trapeze in this workshop but will have Lyra’s during the class for warm up purposes. If taking both days, you are required to sign up for both days. will focus on you working on Silks and Trapeze in this workshop but will have Lyra’s during the class for warm up purposes. and will be split between trapeze and silks. Fundamental mounts and technique will be reviewed on both apparatuses, along with several poses essential to any aerialist. Each student should expect coaching that will broaden their personal understanding and experience with both the trapeze and silks. 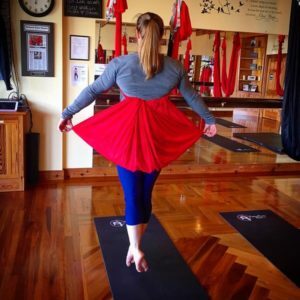 The day 2 workshop will also be split between trapeze and silks. Each student’s skill and level of experience will come into play (if day 1 was attended, day 2 will build further into the poses learned on day 1). Students should expect to learn new poses at their skill level and have fun! 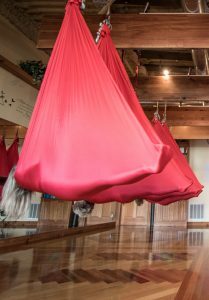 Prerequisites: Must have attended at least 2 AntiGravity, Lyra Flow, or Beginner’s Lyra classes, or have at least 3 months of outside aerial experience. WHEN: Stay tuned for the next workshop coming soon!